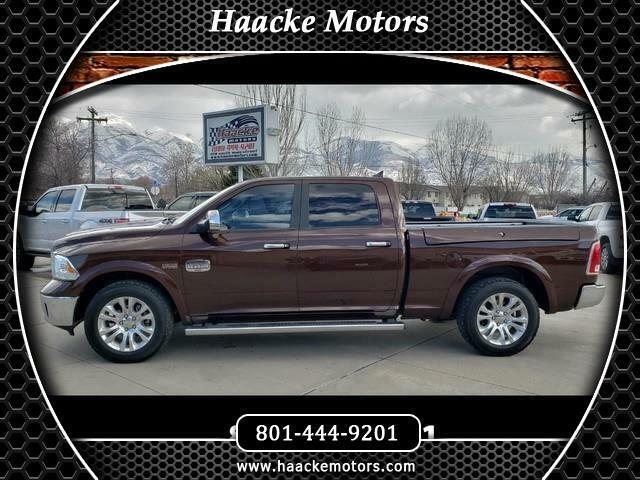 One Owner Low Mileage 2014 Ram Laramie LONGHORN Edition!! Crew cab short bed 4x4. 5.7 Hemi MDS VVT with an 8 speed Torqueflight Automatic transmission. Finished in Western Brown exterior, and beautiful Canyon Brown / Light Frost Beige interior. Let your inner cowboy out with this fully optioned Longhorn! Just a few of the options include... 4 Corner Air Ride suspension, Rambox's, 20" Aluminum polished wheels with silver inserts, Auto headlights with Auto high beam control, keyless Enter ' n Go, Rain sensitive wipers, Trailer tow package with integrated Trailer Brake Controller, Full under body skid plates, 3.:92 gearing with locking rear differential, U Connect, Navigation, Premium sound with factory sub woofer, full window tinit, bed liner, and the list goes on and on... Some Factory Warranty still applies! Visit our website and these other sites for more information www.haackemotors.com AutoTrader.com Cars.com Carsforsale.com KSL.comCargurus.com CarFax Online Listingallcars.com Facebook and Instagram! We’re human, we make mistakes. Please call us if you have any questions! !